Jos Buttler and Eoin Morgan are happy to keep on innovating their batting styles, ahead of England’s one-day international series against Australia. Jos Buttler and Eoin Morgan happy to keep innovating for England Last Updated: 09/06/18 9:41am 0:47 Buttler talks through his innovative approach to batting and his desire to remain unconventional ahead of the series against Australia Buttler talks through his innovative approach to batting and his desire to remain unconventional ahead of the series against Australia Jos Buttler and Eoin Morgan are happy to keep on innovating their batting styles, ahead of England’s one-day international series against Australia. 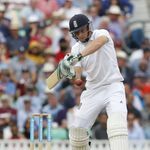 Buttler, who was recalled by England’s Test side for the drawn series with Pakistan, has become famed for his execution of the ‘scoop shot’ and the 27-year-old admitted he intends to continue doing things differently. Morgan, who was named in the ODI squad for matches against Scotland and Australia despite recently fracturing his finger, added: “I tend to leave the crease as late as possible, just as he (the bowler) tries to release the ball I’ll come down the wicket. Scotland vs England June 10, 2018, 10:30am Live on “A key thing to that when you’re coming down the wicket is keeping your head and eyes as balanced as possible so you’re down bobbing up and down or side to side. England will go up against Scotland on Sunday, June 10, before their first meeting with Australia at the Oval on Wednesday, June 13.